There are now calls for the EU referendum to be scrapped and run again. It follows the Electoral Commission’s ruling that Vote Leave, the official Brexit campaign group, significantly broke spending limit rules during the referendum. The group has been fined £61,000 by the electoral watchdog, which has also called for a criminal investigation. Senior Conservative MP Sarah Wollaston said there should be a re-run of the vote because, “we cannot have confidence that this referendum was secure”. She added, "We are talking about deliberate cheating." Labour former minister David Lammy called on ministers to declare the referendum result “void”. Labour’s Chuka Umunna described the Electoral Commission’s findings as “shocking”, telling MPs the actions of Vote Leave represented an “affront to our democracy”. In addition to the fine, the Electoral Commission has referred David Halsall, the “responsible person” for Vote Leave, to the Metropolitan Police for making false declarations of campaign spending. Darren Grimes, the head of a separate Brexit youth group called BeLeave – which received a £675,000 donation from Vote leave – has also been referred to the police and fined £20,000 by the Electoral Commission. Under the rules of the referendum, Vote Leave was supposed to have stuck to a £7m spending limit while campaigning. But the Electoral Commission ruled that Vote Leave secretly went nearly £500,000 over its limit when it made the undeclared £675,000 donation to Mr Grimes’ BeLeave group. This comes after the Electoral Commission last May also fined Leave.EU, another pro-Brexit campaign group, the maximum £70,000 for multiple breaches of electoral rules. The organisation is backed by Nigel Farage and funded by Arron Banks, and played a key role in campaigning for Brexit in the referendum. The group failed to reveal “at least” £77,380 in its spending following the referendum vote, meaning it exceeded the legal spending limits for the referendum, as laid down by law. The Electoral Commission has also referred a key figure in Leave.EU’s management team, Liz Bilney, to the Metropolitan Police due to “reasonable grounds to suspect” that criminal offences have occurred. Both Vote Leave and Leave.EU have strongly denied the allegations. Last May Mr Posner was also critical of Leave.EU for breaking electoral rules for the referendum. “The rules we enforce were put in place by Parliament to ensure transparency and public confidence in our democratic processes. It is therefore disappointing that Leave.EU, a key player in the EU referendum, was unable to abide by these rules. The watchdog found the group had exceeded the spending limit for non-party registered campaigners by at least 10 per cent and said that the unlawful over-spend “may well have been considerably higher”. “We can confirm that the Electoral Commission has referred a potential criminal offence under section 123(4) of the Political Parties, Elections and Referendums Act 2000. The Electoral Commission’s investigation also uncovered that Leave.EU did not properly report the receipt of three loans from Mr Banks, totalling £6m, with dates around the transaction and the related interest rate incorrectly reported. Because the EU referendum was advisory only, the safeguards that allow for legally binding elections to be re-run in the event of rule breaches do not apply. He explained that the referendum was no more than a “glorified opinion poll” in the eyes of the law. Mr Maugham and others, however, argue that the “cheating” and “very substantial” Vote Leave overspending ruled upon by the Electoral Commission should oblige MPs to disregard the referendum result. The Code, which is a non-binding guideline, was adopted by the Council of Europe’s Venice Commission in 2006/2007. The UK is a member of the Council of Europe and has signed up to the Venice Commission. 'National rules on both public and private funding of political parties and election campaigns must be applicable to referendum campaigns. 'As in the case of elections, funding must be transparent, particularly when it comes to campaign accounts. 'In the event of a failure to abide by the statutory requirements, for instance if the cap on spending is exceeded by a significant margin, the vote must be annulled. The Code is a guide only, and not legally binding. 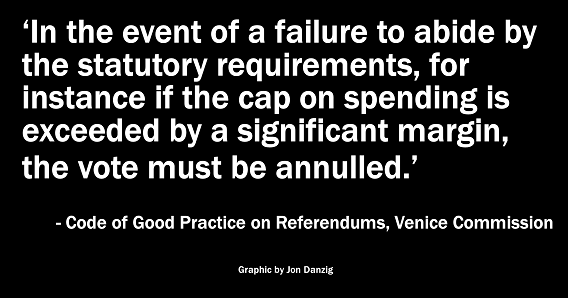 However, it’s now becoming clearer by the day that the referendum campaign was seriously flawed. There was significant overspending by both Vote Leave, and Leave.EU, that broke election law, in addition to allegations of criminality and significant data breaches. And on top of all the lies and mistruths that the Leave campaigns had to rely upon to win the referendum, there are allegations of possible interference by Russia. Anyone who believes in democracy, whether a Leave or Remain supporter, should now be seriously concerned about the validity of the result of the EU referendum of 23 June 2016.